If you love shooting zombies, you should try great shooting experiences through playing Zombie Frontier 3 APK 1.44. It is a really challenging zombie shooting game that could let you enjoying any spare time interestingly. Now, the renewed version of Zombie Frontier 3 is returned in 3D graphic feature to let you incredibly shoot the zombies through your smartphone. Playing this new version of ZF3D game will push your device to its maximum limit, so you would have the better experience while shooting all creepy zombies through the phone. Well, no wonder that people widely called ZF3D as the best zombie shooter game ever. To enjoy this shooter game, you need to use any weapons in your arsenal area such as assault rifles, pistols, sniper rifle, and even shotguns to eradicate all remaining zombies. Furthermore, you will find yourself to live in magnificent zombies’ era and you should survive to stay alive while shooting the zombies and even protect other peoples who still alive there. 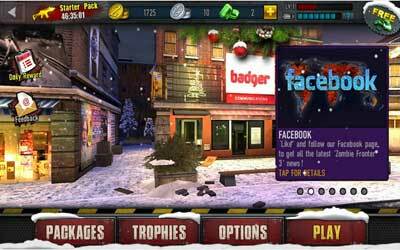 While playing this challenging game, you are able to explore the wider world which full of zombies there. When you try your best to survive at the same time shooting zombies and protecting other alive people, you need to find the clues to outbreaks then find the cures in 4 widely regions through 200 levels. As a smart guidance for you to win the game, you should learn to shoot the zombies as your prioritized target and just remember to shoot them at the head. There are various kinds of zombies differently while playing the game, but remember to shoot all of them at their head to defeat them. Anyway, the size of this game is only 51MB and it could be played through 4.0.3 Android version. Therefore, are you ready to have the most challenging experience in playing Zombie Frontier 3 for android? A new Mode – DLC is opened, look for new chance of survival in “Dead Island”. Three new scenes are added, enjoy your summer holiday. Brand new arsenal, expanded with new powerful and interesting pistols and rifles. New zombie species, you will be faced with more flexible and strong zombies. Scene effect have been optimized. Some bugs have been fixed. Download APK apps & games for Android easily from APKRec. We collect free Android games and apps daily updates, get the latest version or older version. APKRec shares free apps & games only, we never share paid or modified games & apps as Android APK file. Please contact us if we violate the copyright. © Copyright 2016 APKRec. All Rights Reserved.